On arrival, my friend hugged me, took my pack, and told me exactly what I wanted to hear. “It’s only a 15 minute walk to my place, and there’s strawberries and beer in the fridge.” We strolled down the graffiti strewn streets into the rusty orange suburbs of Bolognina. Everywhere walls screamed out ACAB and other anti-police slogans while E gave me a run-down of all the reasons I should hate the current President of France. I nodded along and pretended I had any idea what he was talking about past “the bourgeoisie continue to betray the proletariat at every turn”. This turned out to be something of a theme over the weekend. E’s apartment was bijou and fairly sterile apart from the desk in the bedroom where tiny legions of orcs and space marines lay haphazardly about in various stages of assembly and finish. The bed had been split into two like something out of a 50s sitcom, my side in flowery pink, his plain blue. After asking permission, I tipped out both my bags, opening up every pocket and crevice until my money appeared lodged between the pages of Japanese for Busy People II. Finally, I could relax. Water pounded out of the shower onto me in a torrent, blasting off two days of discomfort and failure like a power washer on gum. There was beer and soup and strawberries and bed and everything was A-okay. The next day the sun shone out as E took me on a tour of the local graffiti in his neighbourhood. He pointed out the oddly named escalators at the station. 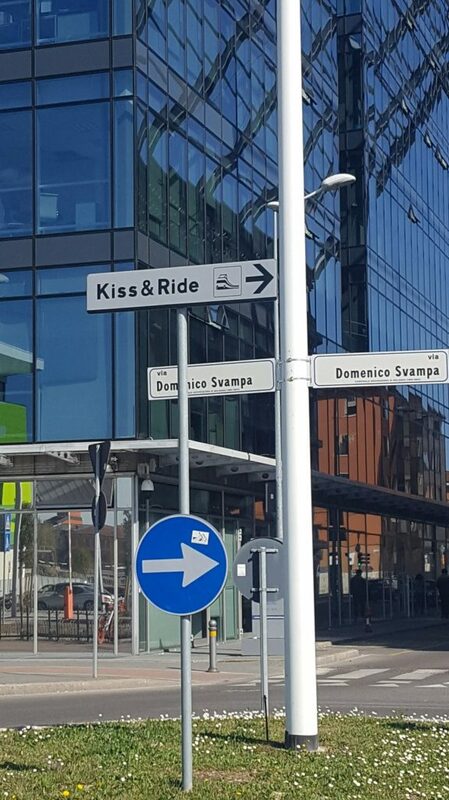 “Why are they called Kiss and Ride?” I asked. Copyright all of the people who made these images. 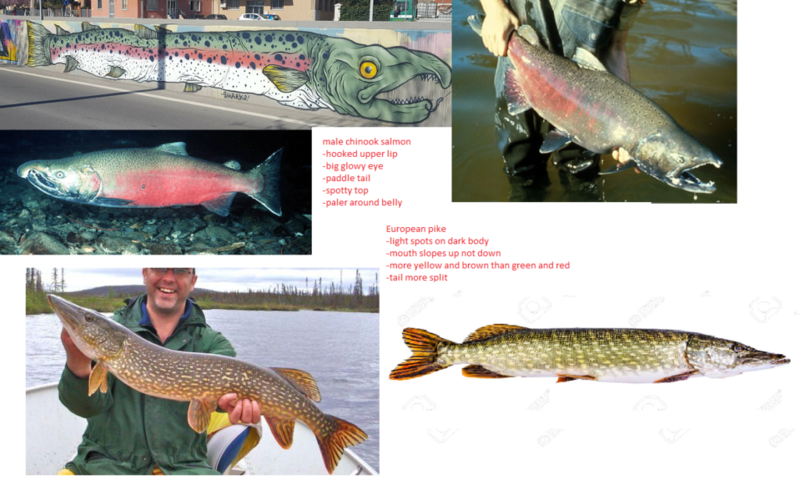 Please don’t sue me in my pursuit of fish classification justice. We went grocery shopping, I made risotto for lunch, and then we headed off to get gelato down Bologna’s arched streets and into the centre of town. My sandals began to chew up my feet, perhaps in some sick competition with my boots. I didn’t care. Bologna was a beautiful enough distraction. 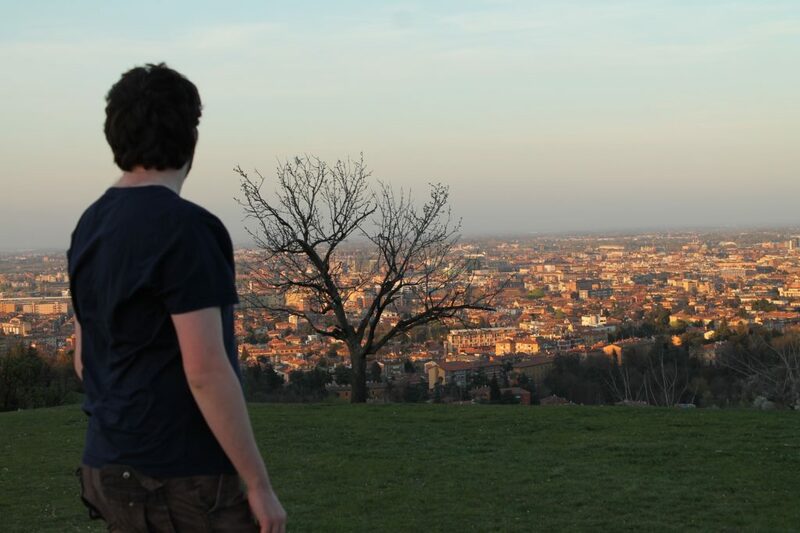 There is not much to tell you of Bologna to be honest, as I was there to see a person rather than the city. The food looked good but thanks to my problem with wheat I couldn’t really eat any of it. 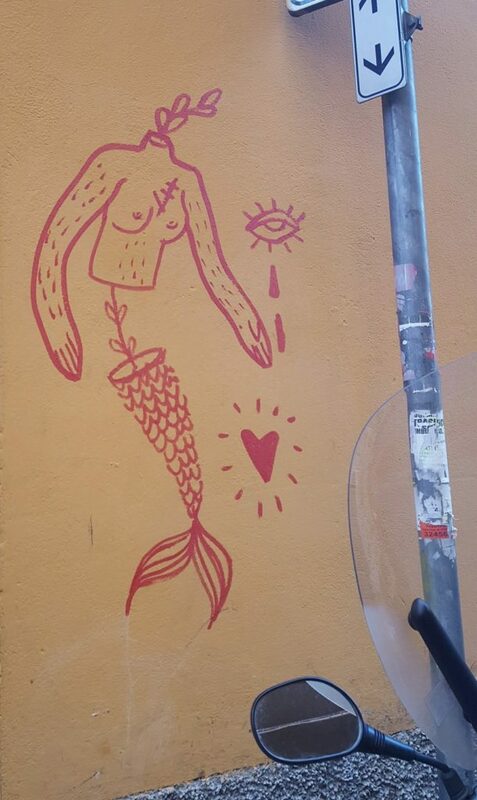 If you like pasta, pizza, and street art; you’ll probably like it. If you’ve always wanted to see a fountain with semi-aquatic spread eagle women powerfully lactating, you can find one in the central square. If you’re a photographer and into architecture, then you’ve come to the right city- at golden hour on a clear day the whole city glows in soft reds and golden tones. The surrounding hills block the sunset itself, but the city just as the sun dips is a view worth a little hike. The trouble with going to see sunsets is that the sun sets. Leaving you in the growing dark, in a park with unmarked paths. Which is how we ended up accidentally strolling onto a private estate with “PRIVATE PROPERTY: GUARD DOGS IN USE” signs everywhere and walked around in circles in the deepening gloom for an hour until we found a dusty path to tumble down, just in time to see a huge black SUV with tinted windows roll up to the entrance gate. That is not a recommended Bologna activity. 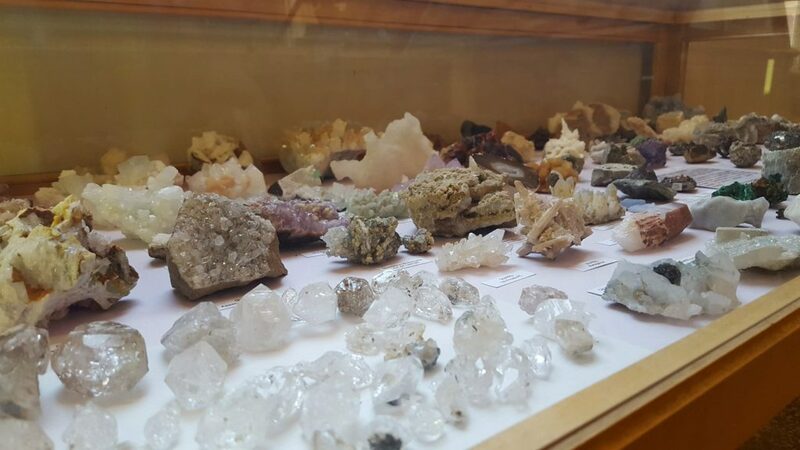 Go to the free geology museum and look at pretty rocks instead.